Today I would like to share some of the history I discovered about our humble quickbread. To begin my research on the history of cornbread, I started with cornmeal. With the first cornmeal artifact dating at around 5,000 B.C., it appears that humans have been grinding corn into edible granules for quite a while. By the time Europeans became familiar with cornmeal in the 17th century, they used it as a substitute for the grains they were used to, and called it maize. Maize was a staple to indigenous cooks and was used alongside beans and chili peppers to create tamales and was also flattened into tortillas. It was also used medically as an ingredient for poultices and infused to help with various stomach conditions. Using simple ingredients and equipment, the colonists used cornmeal to create simple quick-breads such as hoecakes, bannock and johnny cake. As the story goes, hoecakes were named thus due to the meal being spread on the back of a hoe, and held over the fire to bake. (The etymology is more thoroughly explored in the pdf by Rod Cofield, see references for link). Another technique was to use a cast iron skillet with ingredients on hand. As sugar was costly and hard to come by, this was rarely used. 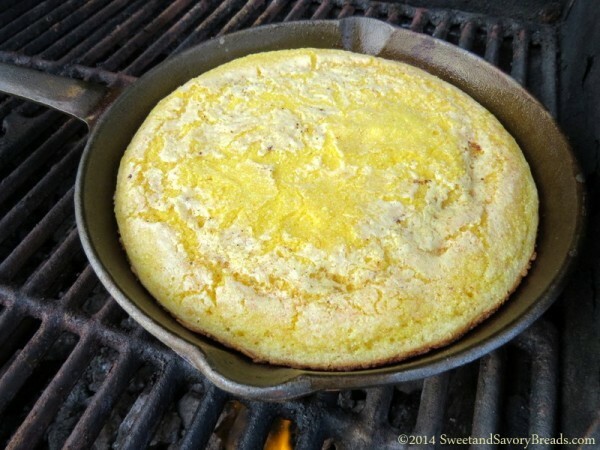 For today's recipe, I tried to create a cornbread with ingredients and equipment that most closely matched what would have been available historically. I did not use any flour or sugar, and I baked the bread in a cast iron skillet over an open flame. Modern cornbread has many regional differences and additions, and this will be explored next week in Part 3 of our Fall Recipe Series. "Corn Bread Quotes." Quotes about Corn Bread. Web. 12 Nov. 2014. 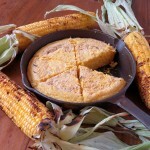 <http://www.foodreference.com/html/q-corn-bread.html>. "Cornbread History." Food For Thought Cornbread History Comments. Web. 11 Nov. 2014. <http://www.indianahumanities.org/foodforthought/index.php/2010/08/cornbread-history/>. This is a basic crumbly cornbread that was baked simply and quickly on the grill. Light your bbq to medium high heat. 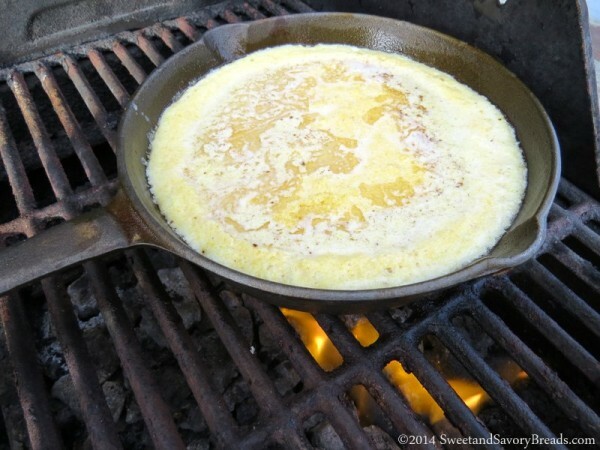 Place bacon grease in your cast iron skillet with and let melt while preparing ingredients. Whisk together the cornmeal, baking powder, baking soda and salt in a medium bowl. Whisk egg in a small bowl until frothy, add milk. Add milk and egg mixture to the dry ingredients and stir. Once the bacon grease is smoking, pour the batter into the cast iron skillet. It will on the runny side. Grill on medium high heat for approximately 10 minutes, or until the edges are golden brown, and the center is firm. This recipe really takes into account the essence of corn meal. By baking it with simple ingredients outside on the grill, it brings to mind the history and tradition of the grain. Since it is so simple, it would do well to add something special such as honey butter. Posted in Fall Recipe SeriesTagged bbq, corn, cornbread, gluten free, grilling, historyBookmark the permalink.